The following examples show different ways to get a reference to a range within a worksheet. The following code sample gets the range with address B2:B5 from the worksheet named Sample, loads its address property, and writes a message to the console. The following code sample gets the range named MyRange from the worksheet named Sample, loads its address property, and writes a message to the console. The following code sample gets the used range from the worksheet named Sample, loads its address property, and writes a message to the console. The used range is the smallest range that encompasses any cells in the worksheet that have a value or formatting assigned to them. If the entire worksheet is blank, the getUsedRange() method returns a range that consists of only the top-left cell in the worksheet. The following code sample gets the entire worksheet range from the worksheet named Sample, loads its address property, and writes a message to the console. The following code sample inserts a range of cells in location B4:E4 and shifts other cells down to provide space for the new cells. The following code sample clears all contents and formatting of cells in the range E2:E5. The following code sample deletes the cells in the range B4:E4 and shift other cells up to fill the space that was vacated by the deleted cells. The following code sample selects the range B2:E6 in the active worksheet. The following code sample gets the selected range, loads its address property, and writes a message to the console. The following examples show how to set values and formulas for a single cell or a range of cells. The following code sample sets the value of cell C3 to "5" and then sets the width of the columns to best fit the data. The following code sample sets values for the cells in the range B5:D5 and then sets the width of the columns to best fit the data. The following code sample sets a formula for cell E3 and then sets the width of the columns to best fit the data. The following code sample sets formulas for cells in the range E2:E6 and then sets the width of the columns to best fit the data. 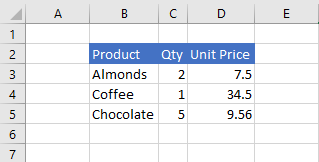 These examples show how to get values, text, and formulas from a range of cells. The following code sample gets the range B2:E6, loads its values property, and writes the values to the console. The values property of a range specifies the raw values that the cells contain. 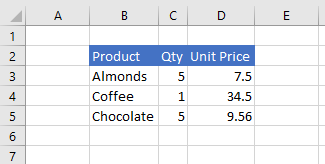 Even if some cells in a range contain formulas, the values property of the range specifies the raw values for those cells, not any of the formulas. The following code sample gets the range B2:E6, loads its text property, and writes it to the console. The text property of a range specifies the display values for cells in the range. Even if some cells in a range contain formulas, the text property of the range specifies the display values for those cells, not any of the formulas. The following code sample gets the range B2:E6, loads its formulas property, and writes it to the console. The formulas property of a range specifies the formulas for cells in the range that contain formulas and the raw values for cells in the range that do not contain formulas. The following examples show how to set font color, fill color, and number format for cells in a range. The following code sample sets the font color and fill color for cells in range B2:E2. The following code sample sets the number format for the cells in range D3:E5. Ranges can have formats applied to individual cells based on conditions. For more information about this, see Apply conditional formatting to Excel ranges. The Range object has a find method to search for a specified string within the range. It returns the range of the first cell with matching text. The following code sample finds the first cell with a value equal to the string Food and logs its address to the console. Note that find throws an ItemNotFound error if the specified string doesn't exist in the range. If you expect that the specified string may not exist in the range, use the findOrNullObject method instead, so your code gracefully handles that scenario. When the find method is called on a range representing a single cell, the entire worksheet is searched. The search begins at that cell and goes in the direction specified by SearchCriteria.searchDirection, wrapping around the ends of the worksheet if needed.